Edwin Ginn, the founder of the World Peace Foundation, was born in 1838 to a humble farming family in New Orland, Maine. After graduating from Tufts University in 1862, Ginn began work as a traveling textbook salesman. He eventually founded Ginn & Co., an educational publishing house distinguished for its commitment to innovation. By 1896, when Ginn moved his printing and publishing headquarters to the Athenaeum Building in Cambridge, MA, his company was one of the largest educational publishers in the country. His activities were part of an emerging international movement that traced its conceptual roots to Immanuel Kant’s notion of “perpetual peace” based upon a “league of nations.” While not all were pacifists, many participants in the movement believed that advancing international commerce, democracy, law, and diplomacy would provide the building blocks for a definitive era of global peace. Marrying his educational philosophy with his engagement on peace, Ginn launched the International School of Peace on July 12, 1910. By December 22nd of that same year, Ginn’s vision shifted from a school to the World Peace Foundation whose existence was secured through his gift of an endowment. Edwin Ginn died on January 21, 1914. In 2011, the WPF moved to the Fletcher School of International Law and Diplomacy at Tufts University, with Alex de Waal as its director. The move to Tufts University marked a coming home of sorts for Edwin Ginn’s philanthropic and educational endeavors. He was not only a Tufts alumnus, but he also served on the University’s Board of Overseers from 1898 until 1906, and as a trustee from 1907 until his death. The University was among the beneficiaries of his philanthropy, which helped create what became the Ginn Library at the Fletcher School, where his portrait now hangs. A gallery of images give a glimpse into the rich visual and historical materials in the archive of the World Peace Foundation. The imagery draws largely on pre-1945 materials. Learn more about the World Peace Foundation in the context of the American peace movement before World War I in Peter Filene’s essay, The World Peace Foundation and Progressivism: 1910-1918 reprinted with permission from the New England Quarterly, Vol. 36, No. 4, (December 1963), pp.478-501. 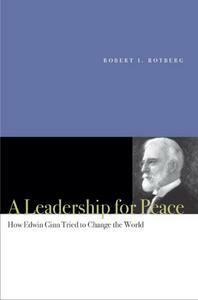 Learn more about the life and work of Edwin Ginn, see A Leadership for Peace: How Edwin Ginn Tried to Change the World by Robert Rotberg (Stanford University Press, 2007). The WPF historical archives are today split between Tufts University’s Digital Collections and Archives and the Swarthmore College Peace Collection.